As a support worker at Community Living Algoma, Dawn Bellerose is part of a team that delivers social services to people with developmental disabilities and their families in the Sault Ste. Marie region. This role gives her a frontline understanding of the financial pressures in Ontario’s publicly funded social services and the resulting stresses on individuals, families and employees. Developmental services agencies have increasingly adopted a model of “supported independent living” for some of the people they serve – where individuals can live on their own or with a friend or partner, while receiving agency supports and services. Helping individuals achieve a measure of independence is critical, Bellerose says; however, the funding for such living arrangements is often unavailable. “We’re trying to support them to live in their own homes, but it’s extremely challenging. Too often, we have to tell people ‘no’ because there’s no money,” says Bellerose. Developmental services are one category of social services delivered by around 35,000 CUPE members across the province. Members also deliver assistance to women and children fleeing domestic violence, staff shelters, protect children from harm and neglect, provide employment counselling or HIV and AIDS education, and deliver social assistance. Employers range from small non-profit communities to large social assistance programs and municipalities. 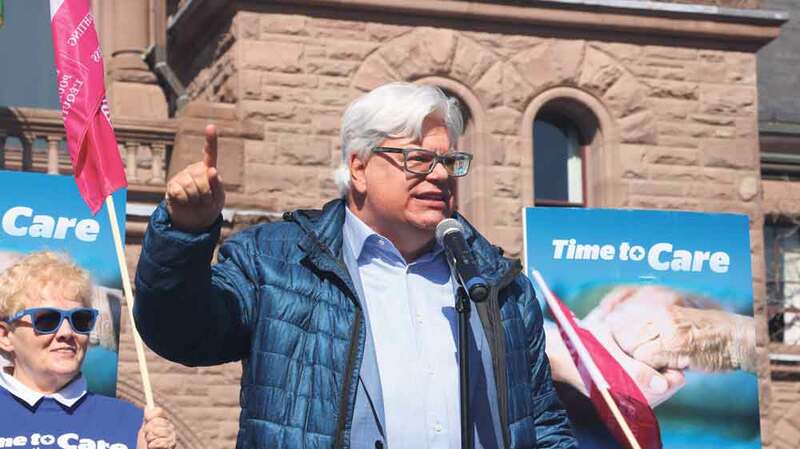 No matter what the service or type of agency, the cumulative effect of long-term underfunding has widened the gap between community needs and organizations’ capacity to meet demand, says Fred Hahn, the President of CUPE Ontario. “For people who use social services, wait lists have become the norm,” Hahn says. “And agencies are trying to deliver services by cobbling together a patchwork of funding from different sources – funding that has often remained flat for many years. CUPE is concerned about the impact of funding pressures on its members, who are often directed to make everything work by increasing “efficiency” and “cost-effectiveness.” Hahn says these business models have no place in an agency serving vulnerable and often marginalized people. Salaries in social services are also generally lower than in other public sector services, such as health care and education, which creates a gender pay gap, as most social services employees are women. Social-service experts often talk of a “care penalty” – the fact that people working in community agencies are doing vital but undervalued work. What will the future be for Ontario’s social services sector under the new Progressive Conservative government? Although the Ford government has yet to detail its plans, CUPE sees warning signs. The new government recently announced that payments under Ontario Works and the Ontario Disability Support Program would increase by only 1.5 per cent and not the 3 per cent planned by the previous government. And Premier Doug Ford has said his government wants to bring new efficiencies to the public service, while also saying there will be no job cuts. “Let’s be clear: it’s doublespeak to say you can achieve efficiencies in public services and also to say you can do it without losing jobs,” Hahn says. CUPE’s mission is clear, he adds. “We will track every job and every service that is lost and will make sure this government is held accountable for every one of them.